Size 11/0 - 34F. Toho seed beads. Their sparkling golden hue is perfect for those special designs that require a touch of elegance. Toho seed beads sold in 8.2g storage tubes. Size 11/0 (2.2mm) seed beads. Colour: silver lined topaz. 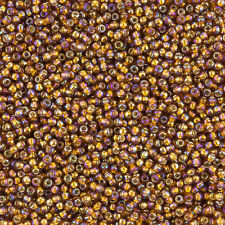 Toho’s have a larger threading hole size in comparison to other seed beads available. This allows for multiple passes of thread and creates a much lighter bead to work with. 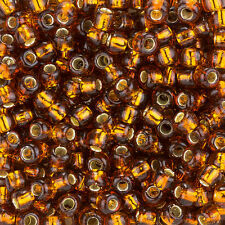 Toho seed beads sold in 8.2g storage tubes. Create beautiful jewellery designs and sparkling knitted projects using these larger 5.5mm Toho seed beads with a smoky topaz/ amber hue and sparkling silver lining. Toho seed beads sold in 19.5g storage tubes. Ideal paired with our collection of violet beads and findings. Toho seed beads sold in 19.5g storage tubes. Size 3/0 (5.5mm) seed beads. Colour: silver lined light topaz. 110 seed beads per tube. We have a huge collection of glass beads, semi-precious gemstones, silver and gold beads, pendants and charms, alphabet letter beads, Swarovski beads, horn and bone beads, pearl beads, a variety of stringing materials, quality findings and much more. Colour: silver lined smoky topaz. 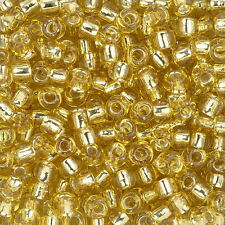 Size 3/0 (5.5mm) seed beads. Japanese glass seed beads. We have a huge collection of glass beads, semi-precious gemstones, silver and gold beads, pendants and charms, alphabet letter beads, Swarovski beads, horn and bone beads, pearl beads, a variety of stringing materials, quality findings and much more. Top price / performance ratio! Suitable for hand wash. Seed beads with silver collection, Topaz, 2.5 mm, 20 g. Tinkering with wood. Price errors and changes reserved. de are crossed out. 42579 Heiligenhaus.